NEW YORK (CNNMoney.com) -- Amid concerns about an escalating debt crisis, European officials on Sunday announced an €85 billion bailout of Ireland and its banks. They also detailed a new protocol for similar rescues of European nations in the future. "This program is absolutely essential for the country," Prime Minister Brian Cowen said at a press conference. Ireland's economy has been ravaged by a collapse in housing prices, unemployment and a financial sector meltdown. The government, which has backstopped many of the country's heavily indebted banks, has run up a huge deficit that now nears one third the size of the overall Irish economy. On Tuesday, Ireland's government debt was downgraded by Standard & Poor's. Meanwhile, in a worrying sign that investors see Ireland's position as precarious, yields on government bonds have spiked, with the yield on the benchmark 10-year bond breaking the sky-high 9% barrier. One worry has been that Europe's debt problems could spread further -- that the crisis scenario faced already by Greece and more recently by Ireland would be repeated by other struggling economies such as Portugal and Spain. The Irish rescue: After long insisting that Ireland would not need a bailout, Prime Minister Cowen turned to the European Union and International Monetary Fund for help last week. The bailout announced Sunday, which totals about $113 billion, includes €67.5 billion in loans from the EU, the IMF and three nations: the United Kingdom, Denmark and Sweden. The other €17.5 billion would come from Ireland's own reserves and pensions. The rescue money will be used to stabilize the country's banks and fund government operations. The move means Ireland will not have to borrow money from private investors for the next three years. The country will pay an average interest rate of 5.83% on the bailout loans. Austerity backlash: Cowen's government has announced a painful four-year austerity plan involving deep cuts in spending and public-sector jobs, a lower minimum wage and higher taxes. The moves are unpopular in the country, and Cowen's party lost an election Thursday for a parliamentary seat. 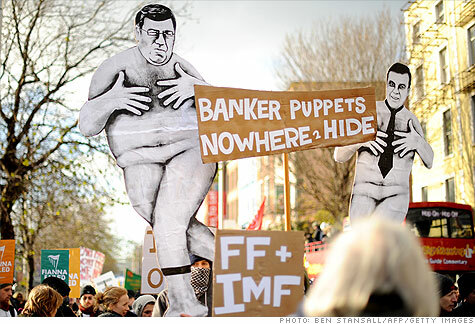 On Saturday, an estimated 50,000 people demonstrated against austerity in Dublin. The protests were organized by the Irish Congress of Trade Unions, which has called the four-year plan for spending cuts and tax hikes "savage and regressive." Families, retired people, the unemployed and members of unions and community groups were among the demonstrators who braved a rare dusting of snow to come out Saturday, the union said. Trade unions complain the plan unfairly targets lower-paid workers, while making no provision for a tax on asset wealth. They say it fails to explain how the Irish people can carry the banks' massive debts and sets out no strategy for creating jobs. "People are angry and they've had enough of this government," local journalist Juliette Gash told CNN. "They're furious because they feel like the government has handed over the keys to the country." Future bailouts: The Irish bailout comes at a particularly sensitive moment. In May, the EU bailed out Greece and set up a temporary fund to rescue other countries in need of help. In October, EU policymakers agreed on the need for a permanent fund to stabilize member nations in the future if necessary. Meanwhile, officials and public sentiment in Europe's stronger economies, particularly Germany, have been warning of the danger of bailouts. Some have pushed for tough terms that force investors -- or holders of government bonds -- to suffer financial losses. The new program announced Sunday would, starting in June 2013, offer bailouts to EU member countries under "strict" conditions. To "protect taxpayers' money," rescues arranged under the new rules would force the restructuring of private-sector debt "on a case by case." -- A CNN Wire report was used in compiling this article. Journalist Peter Taggart contributed.